Today Officer Jeff Tobin was memorialized after losing his battle to brain cancer. 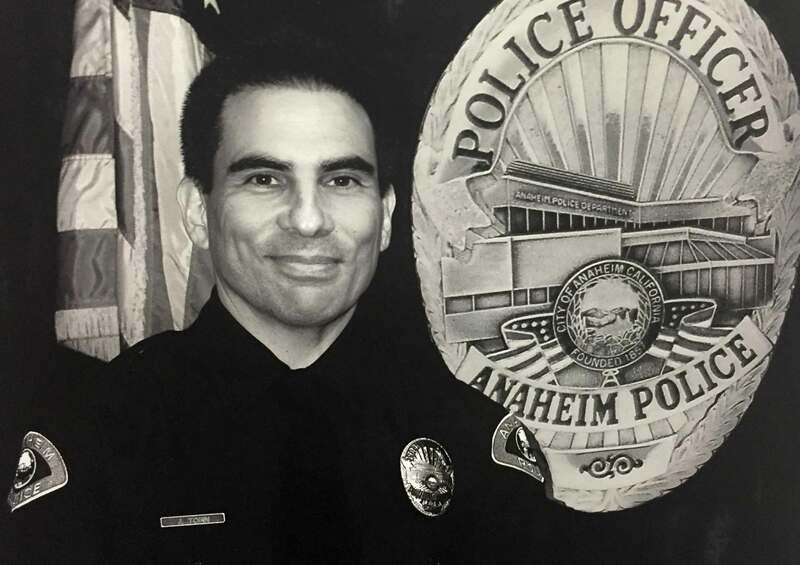 He was and will forever be an Anaheim Police officer. He was also our friend. I happened to be just one of many people who were proud to call him a friend. He was many things to many people. He was a prosecutor, police officer, instructor, artist, triathlete, and skydiver to name a few. But most of all he was a friend to all. I sat there today and listened to the speakers eulogize him and it showed me how many people he had touched. Anyone who knew him was better for it. When he spoke to you, he made you feel like you were the most important person at that moment. He would drop anything he was doing to help you. Jeff’s story was of climbing summits and then finding another mountain to conquer. He was about respect and treating people with dignity. He was a helper and a giver. He was a person who never complained and never asked for anything in return. Every person who walked out of the church today should have learned something about themselves. They should’ve learned how small we are when compared to a giant of a person like Jeff Tobin. Jeff was a gentleman. Jeff was compassionate. Jeff was the officer you wanted coming to your house if you needed help. Jeff was an example to all. Jeff always smiled and gave his all. We should learn from him and do the same. The world would be a better place if we gave half of what Jeff gave to us. Jeff was pure as the sunrise and as bright as the brightest star in the sky. Jeff left his mark on all of us like footprints on wet sand. Each step made an impression on everyone he met. Thank you Jeff. Rest in peace our friend. This entry was posted in My random things about police work by Badge415. Bookmark the permalink. i’m glad you liked it. Thanks for letting me know. I appreciate it. Take care.